I HATE Bob Marley... wheewww, there I said it. I feel sooo much better. I just hate keeping secrets from you readers. I know, it's sad, but true. I mean I don't hate Bobby boy himself, but the music is like nails on a chalkboard. Let's just say an unnamed boardwalk grille had one, and only one cd during the summer of '98... and that was one looooong summer. ... but Bobby was right, well at least about the sun shining and the sweet weather the East Coast is getting this weekend. Which may possibly make it the 1st weekend of the year that is hasn't been snowing or raining like crazy. Spring is here and it's shouting out to bring your flippy floppies! So after digging up some weeds - isn't yard work like 1000x more fun in the sunshine?... I headed to my local outlet mall (along with the rest of the tri-state area)... I didn't want to stay long, 1. because I'm trying to limit my sun exposure and 2. the outlets are major trap for the "but its cheaper than at the mall AND 25% off!". I strolled in the BCBG MaxAzria Final Cut store - which was insane, racks of $9.99, $19.99, $29.99 and so on. Cute cocktail dresses for cheap cheap cheap (!) ... but since I'm not in dire need of a cocktail dress at the moment, my wallet didn't find it worth it to buy a mediocre dress for a week's worth of java. So I left and braved the J.Crew Factory Store. The place was busting at its seams with high schoolers, twentysomethings, and soccer moms alike. I find you need to 'stick to the basics' at the J.Crew Factory Store. Classic Tanks, Tees, and Cardigans won't steer you wrong, but the more 'embellished' or 'designed' items seem to really lack in quality and fit compared to their Brick & Mortar counterparts. 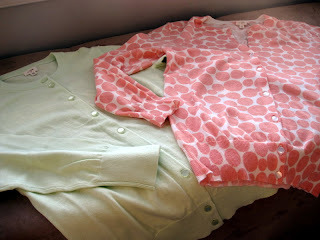 Two J.Crew Jackie's - from what I can tell, Factory Store Jackies are as close as they can be compared to B&M Jackies. Except that solid color B&M Jackies cost $62 and solid color Factory Store Jackies are $44.50. The patterned Factory Store Jackies are $69.50, of which there is a nice variety. In B&Ms, printed jackie style cardigans start at $88. 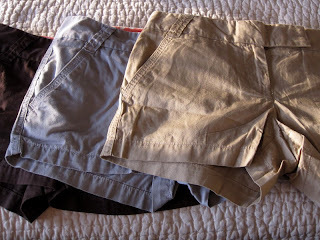 Then I picked up another pair of 3" Chino Shorts. I say another because last year I bought these in grey and brown and lived in them all summer long. This time around I chose classic khaki. Theses shorts retail at B&M J.Crew for $39.50, the Factory Store sells them for $34.50. They were also on promotion for an additional 30% off, marking them down to $24.15. 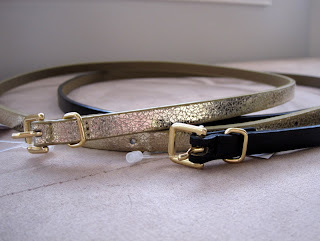 Then while in line at check out, I waffled over a gold or black super skinny belt. While these are currently sold out on online (however, I've seen plenty in store), they retail for $29.50. At the factory store they are $24.50 and also were 30% off, so in reality only $17.50 each.... so naturally I bought both! I almost forgot to use my 20% Off a $100 Purchase coupon until the super friendly SA reminded me. So Gold Star for awesome customer service! See what I mean, how the Factory store is clutch for the classics! I'm so happy I got some color in my wardrobe... I mean I still love grey and tan, but being sunny and Spring, these light breezy colors just seem to fit the mood. Do you shop outlets often? Any fun "Spring" purchases this weekend?? wow you got a lot of great items, love the cardis, shorts and skinny belts! Kelsey - glad I could be an enabler! But beware, outlets are known for suckering you into buying crap items. Be sure to be selective about fit and quality or else you'll get home and be all "ughh, why did I buy this?... oh yeah, it was cheap"
V - I was actually super impressed with my savings when writing this post. It'd be one thing, if there was a big difference like cotton vs merino wool, but for identical items, the savings is amazing... I love the feel of deal! Love those belts! Great finds! Andi - but but but you have to understand the conditions I was put under. Bob Marley 24/7, it took it's toll. I seriously don't *hate* it, but it has a time and place... backyard summer bbq -yes, drive into work at 8am -no. Hey! Fellow Philly blogger here. I love that you showcased J.Crew outlet! I recently have been debating which of their skinny belts to get, but never end up wearing the belts I buy. I recently bought a great grey eyelet skirt at the outlets up over in Hershey, PA. I already have a ton of ideas for it this summer. If you get the chance check out my blog and subscribe if you like! I haven't been to the Hershey outlets, I normally go to the Philadelphia Outlets in Limerick, they have a great selection ofnstores... maybe some day I'll venture further out. I know the Lancaster Outlets have a Pottery Barn - I'd love to hit that up!